How Much Weight Should I Lose the 1st Month on the Atkins Diet? The Atkins Diet website claims that you will lose up to 15 lbs. in the first two weeks, or phase 1, of the diet. During phase 2, which usually begins in your third week of the diet, you continue to lose weight, but at a more moderate rate, while adding more foods back into your diet. The Atkins Diet is a low-carbohydrate diet that claims eating fewer carbs helps you lose weight by causing your body to burn fat for energy instead of the carbs it would normally burn. During the first phase, you consume only 20 g of carbs a day, which is a far cry from the Institute of Medicine's recommendation of 225 to 325 g of carbohydrates per day. You consume 40 to 60 g of carbs a day during the second phase and work your way up to 45 to 100 g by phase 4, which lasts for the rest of your life. 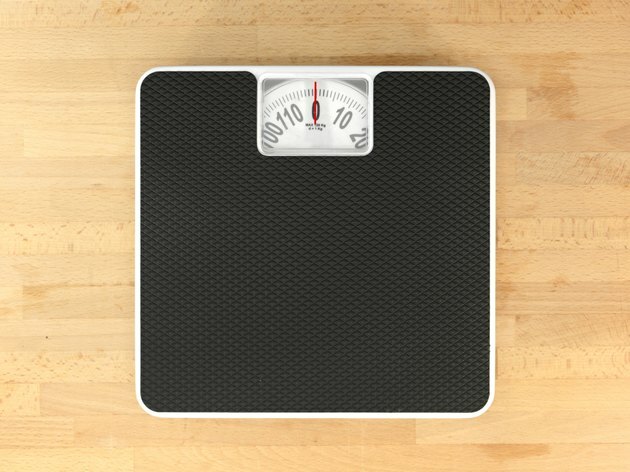 MayoClinic.com explains that losing 15 lbs. is not typical on this diet. Dr. Atkins even explains in his book "Dr. Atkins New Diet Revolution" that you are more likely to lose about 10 to 14 lbs. during the first month on the diet. Of course, the amount of weight you lose depends on many factors. Exercise helps you burn calories and lose more weight, while how carefully you follow the diet and the amount of fat in your diet all affect how much weight you lose. Restricting your carbohydrate intake leads to a state of ketosis, which the Atkins diet promotes because it might cause appetite suppression; however, there is little human evidence supporting this, as noted in a May 2008 article published in "The American Journal of Clinical Nutrition." Your body needs carbohydrates to completely break down fat; without them, ketones develop, which are partially broken-down fats, causing the state of ketosis. Ketosis can come with side effects like dizziness, gout and kidney stones. Also, although proponents of the Atkins diet claim that the diet keeps your energy levels steady by balancing your blood sugar, a state of ketosis can cause a lack of energy. MayoClinic.com notes that it might be the calorie restriction, instead of the low-carbohydrate diet, that results in weight loss on this diet. Also, although the diet promotes quick weight loss, it’s not a good idea to lose too much weight too quickly. The safe recommendation is to lose 1 to 2 lbs. per week. If you lose weight too quickly, you might be losing muscle mass or water weight, instead of the fat you want to lose. Can a Low-Carb Diet Cause Low Blood Pressure? How Much Carbs, Fat and Protein Should You Eat Daily to Lose Weight?